April 21, 2017, 9:52 PM · Buying a rare, antique Italian instrument is prohibitively difficult and expensive -- even more so for violas than for violins. Why? Because antique violas are actually even more rare than violins, and if you want something like a Stradivari, those are priced in the millions these days. But there is good news: the new "Golden Age" of violin-making also extends to viola-making, and finding a high-quality modern viola is not hard to do, if you know where to look. 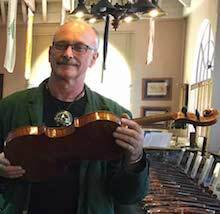 And that is why I decided to (spend an absurd amount of time editing video to) bring you some samples of 33 of today's finest violas by top modern makers, demonstrated by violist Richard O'Neill, as a follow-up to our blog that featured 50 modern violins, demonstrated by Martin Chalifour. Richard O'Neill. Photo by Metzler Violins. This by no means represents every excellent modern luthier's work - there are many more, and I welcome you to list other recommended modern makers in the comments below. But this was a good representation of American makers, from an exhibit and sale in early April by Metzler Violin Shop in Glendale, Calif. The 33 makers were from all over the United States and Canada, and asking prices for the violas ranged from $8,000 to $35,000. This weekend, Metzler will bring this same exhibition of modern violas, violins and cellos to Las Vegas, where the instruments will be on display (and sale) Sunday at the Nevada School of the Arts in Las Vegas. In early April, violist Richard O'Neill demonstrated the violas, and he gave some feedback about how the violas felt and sounded. Some of the issues for violists include the size, weight and shape of this potentially unwieldy instrument. O'Neill also paid special attention to which patterns luthiers used, whether they were following in the footsteps of the makers of old, such as Andrea Guarneri, Bergonzi, Camilli, Maggini, Amati and Stradivari. He said that, though Stradivari made unbeatable violin patterns, his viola patterns do not necessarily out-perform those of the other celebrated makers. He also talked about projection vs. "fuzz" in the sound, and how a mix of both is best. These qualities can be deceptive under the ear, so it's important to have another person help one decide if a particular viola can project across a room or hall. While I have streamlined the hours-long demonstration, I have included a number of O'Neill's comments that related to analyzing violas and their setup. I hope you find this helpful! In this segment we hear a viola by longtime Violinist.com contributor David Burgess, who had the largest viola, at 17 inches. O'Neill also was happy with the power and projection of Andrew Carruther's viola, and he spoke a lot about the proportions of the viola in general, for example that narrow shoulders can make them easier to get around, and that a larger lower portion can compensate for that, soundwise. The excerpts O'Neill played were from the Bach C major Suite; Walton Concerto 1st mvt. ; and Brahms Op. 67. O'Neill complimented the craftsmanship on Joseph Liu's viola and also pointed out the expert antiqueing on Tetsuo Matsuda's viola. The sound of the viola by David Polstein and Chris White stood out to me for the way it flowed. 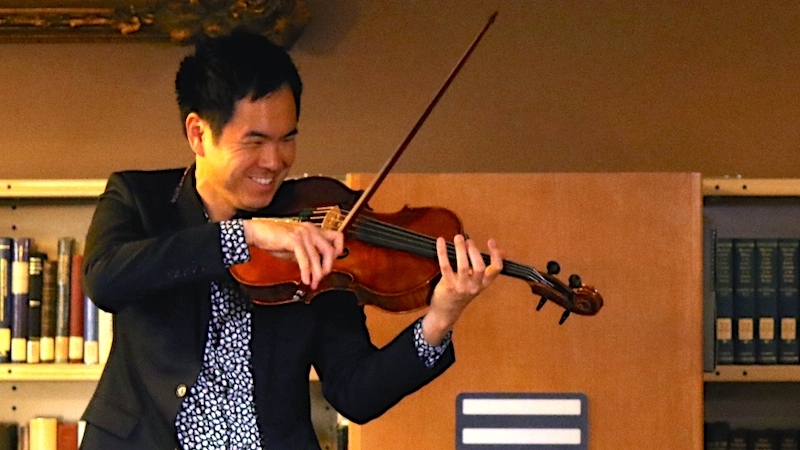 The viola made by the Rezvani brothers (who were present in the audience) was patterned after the "Conte Vitale" Andrea Guarneri, which is owned by the Seattle collector David Fulton. Anna Sandys, who was in the audience, explained that her viola was patterned after the "Roberto Diaz" Camilli viola. Carrie Scoggins (pictured right with Anton Domozhyrov), also present in the audience, said her viola has a maple back and is patterned after a brothers Amati viola. The viola by William Scott was a big viola (16 3/4 inches) with a big sound! Peter Shaw's viola had a specially-shaped tailpiece that extends the "C" string. Alexander Tzankow's viola, at 15 1/2 inches, was expecially manageable and lightweight for O'Neill. Luthier Ute Zahn was in the audience and shared that her viola was patterned after a Nicolò Bergonzi viola. April 22, 2017 at 05:13 AM · Thanks so much, Laurie. I was waiting for this! April 22, 2017 at 11:43 AM · How wonderful of you to put in the effort to make this presentation for the delight of all violists. What a treat!